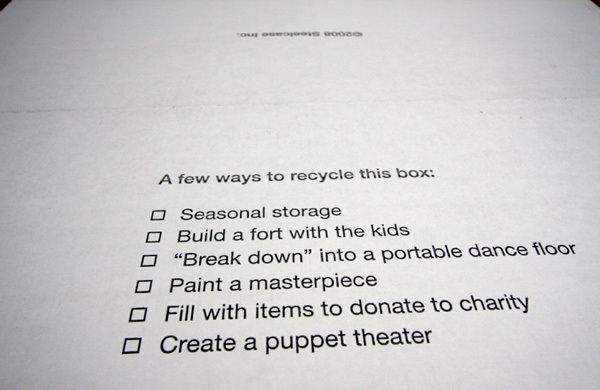 Personally - building a fort was my first choice ~ but dance floor was hilarious ~ and painting a recycled box masterpiece awesome as well ~ but PUPPET THEATER!!!! blew my mind. So traditional and old school, but i instantly imagined hours of amusement if my sister and i were little… so if you order a bunch of these for your office, please, have a weekend where you invite all the kids in to build forts, make art, and have a puppet show! (and yes, storage and donations are good ideas too) That being said, i was quite distractedly inspired by the time i had to figure out how to lift/tilt/maneuver the awesome chair out of the HUGE box! 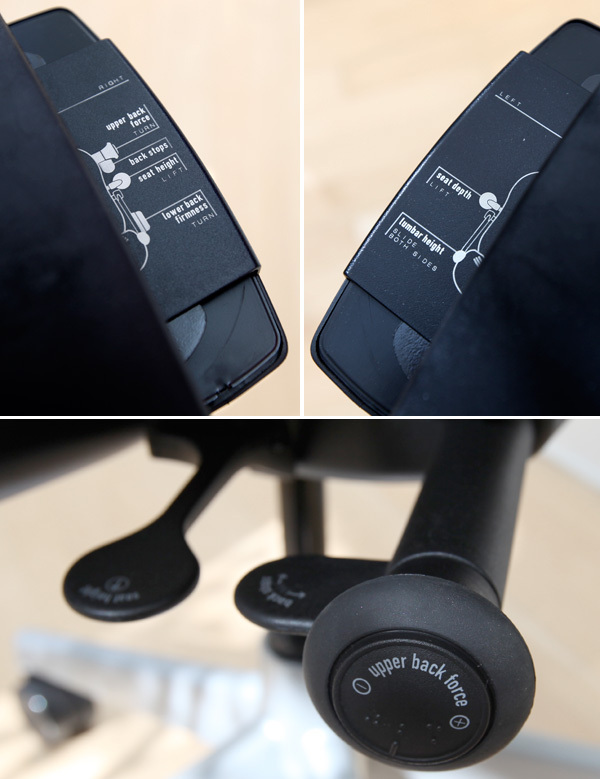 Here is a look at a few detail shots i just took ~ i love the way they give you shortcuts in the armrests ~ not that it’s so complicated, but just nice if someone new happens to try it out! And a closeup look at the mesh backing ~ super comfy! Ok, here’s my favorite!!! 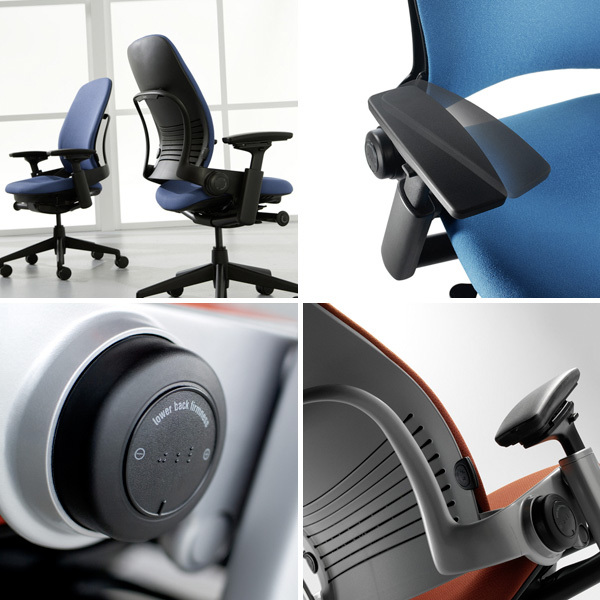 When i was browsing the Steelcase Leap Microsite i had to share these pics of the tester chairs they made to perfect each and every aspect of the final Leap!!! 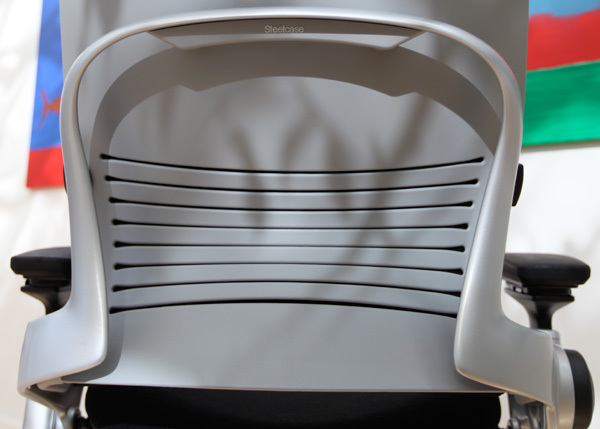 · The technology in the Leap extends through the company’s seating portfolio and has been integrated (in some way) in virtually every chair launched by Steelcase since Leap (e.g. Think, Amia, Move, Siento, cobi and i2i). 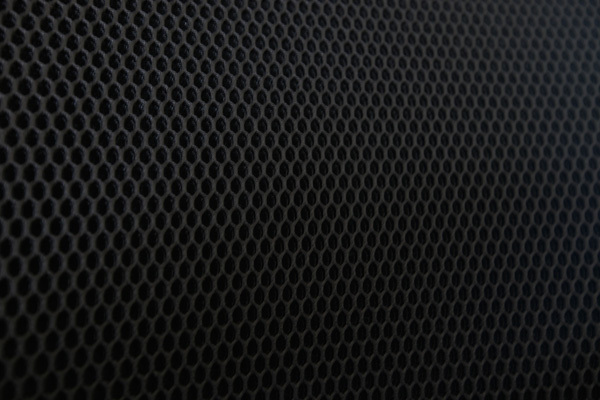 It has also been licensed for use in automobiles and airplanes by those industries respectively. The Leap technology is currently being used by Cathay Pacific and Japan Airlines with other airlines close to announcing their plans to integrate as well. Ooooh and for the record, while i still LOVE the look and feel of the Think chair, the Steelcase Leap is definitely more supportive of my overworked little body… If you ever wander past one in an office, etc ~ hop in and feel for yourself! Take Ben’s advice and look into the Ergohuman. My boyfriend bought one for our home office for like $540 or something. I think it is awesome and I have actually kinda taken it over becasue I think it is so comfortable! I would use that big box for storage, storage, storage….I dont throw away anything. 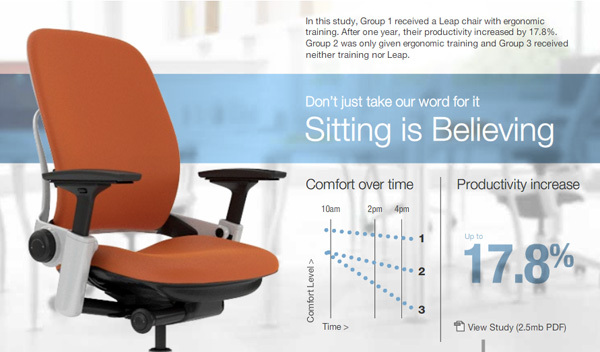 The steelcase leap will help my what seems like always aching back. Maybe its the 5 year old on sale chair from Staples that is the problem ??? These are the best general purpose office chairs out right now, IMO. Definitely worth the price if you work sitting for a large portion of your day. I can work 12 hours straight without any pressure points or pain. They do take a bit to get set up right, but so does every other chair, and once it is dialed-in it is bliss. We use these for all of our employees and have had no complaints. The fact that they are one-size fits all is a bonus from that perspective as well. 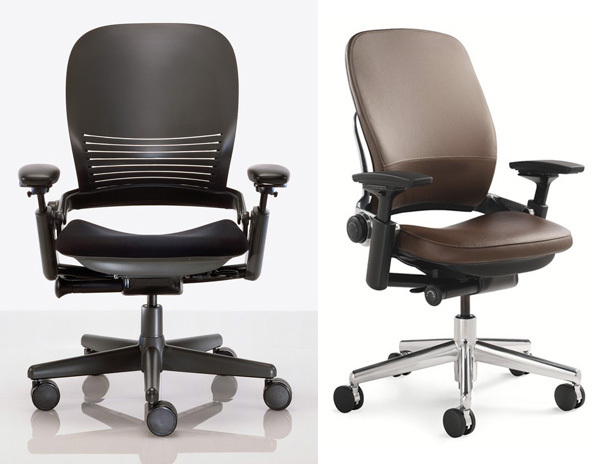 I own a Herman Miller Mirra at home, and I’ve tried pretty much every other chair at some point and none matches the Leap. Most recently, I tried an Aeron and after a month of trying every possible adjustment, it still wasn’t as comfortable as the Leap so it is now an expensive coatrack until it get sent back. My only real complaint with the Leap is the how the arms wiggle a bit - it just could be more solid, but the full range of adjustment motion in arms make up for that. It isn’t a dealbreaker by any means, I was trying to think of something negative to say :) The newish design of the Leaps is a definite improvement over the older ones as well. Sorry for the long-winded post, apparently office chairs is a passion of mine. 3. It will mean I can finally do away with cheaper office chairs and sit for hours in more comfort. 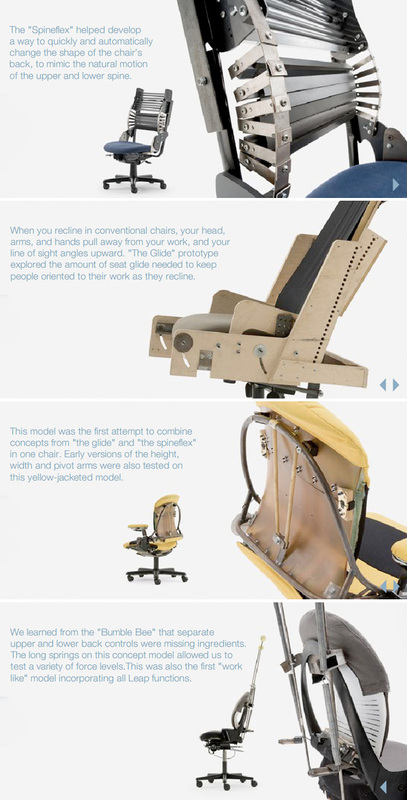 I might sound a lil’ partial here, but working in Grand Rapids, knowing few of the people that are working in Steecase, I know the level of comitment and engineering that goes in every chair assembled in Steelcase. Great quality and design, quality and made in USA, what more can you ask for ( maybe lower price, i know, I know…). Yes its a tough one to prioritize ~ but when you think about how much time you spend in front of your computer (in our line of work especially) and how much time spent sleeping (relative to life itself!)…. definitely seems worth shelling out for great beds and desk chairs to help take care of our aging bodies! 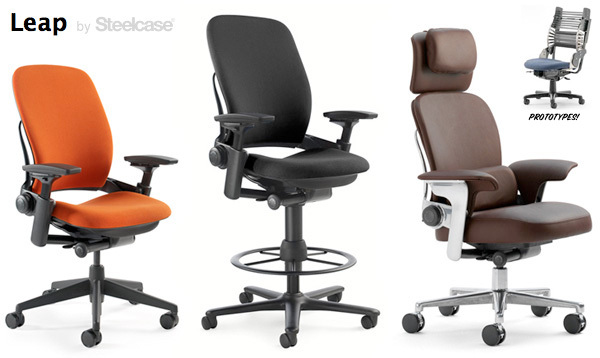 I want to buy a really nice office chair like a Steelcase, but I just can’t justify it! I know I spend 6-8 hours or more in it 5 days a week, but upwards of $1000 is big chunk of change to drop - particularly when your employer won’t even absorb part of the cost. Hmmmm, maybe if I take the hours spent sitting in a year & divide the cost that way it will seem more attainable. I quit my regular job a few years ago to do my own thing at home. Despite the fact that it cost about a months worth of rent, the first thing I got was a LEAP. I’d had one at work for a while so I knew how great it was, I went all out and got a beautiful black chair with fancy chrome style trim! It’s been serving me well for 3+ years now and I plan on keeping it for many many more. No more work-chair related back aches, and I even sit in it all stupid and slumpy half the time! It still supports me well! I work from home and absolutely love my Leap Chair. It isn’t as “comfortable” as sitting in a highly-cushioned chair, but I can sit in it all day long and never notice any back fatigue. I would tell a MUCH different story after sitting all day in my old chair.